A dip for all seasons. My love for dips is no secret. I’m not sure why I can’t resist them, but make no mistake; when there are dips around, I’ll be close by. Garlic and onion, sweet mustard, sour cream and chive, sweet chilli, satay, tzatziki, taramasalata, baba ganoush…the list goes on. I’m happy dipping bread and all kinds of things until there’s an empty bowl. Last week I shared my recipe for a rich beef mole and admitted that I used it as a dip for my tortilla chips. I just couldn’t help it to be honest. 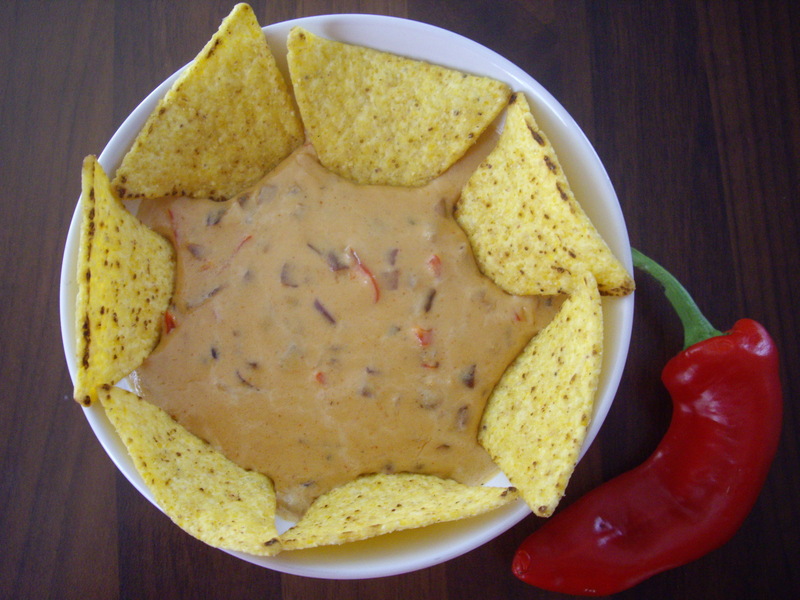 I’m doing my best to cut down on the nacho action, but as a final word on the subject, I’ve decided to share a recipe of mine for chili cheese dip. The world is full of wonderful versions of this, but I like mine because it’s creamy, really cheesy and open to the addition of other ingredients if it takes my fancy. In the height of summer, or the depths of winter, this dip will see you through. Once you’ve tried this, you won’t make chili cheese dip any other way! Enjoy. I made this dip in a milk pan. It was the perfect size for a small bowl of dip, but you can increase the amounts and make the dip in a large pan if necessary. Begin by cooking the red onion in the olive oil on the lowest heat until it is beginning to caramelise. This brings out the sweetness of the onion. Add the chilli and give it a good stir. Cook it for a further two minutes and stir to stop the onion from burning. Pour in the double cream and stir. Add the smoked paprika. Tip the Cheddar in and stir thoroughly until completely melted. Keep stirring until the dip is nice and thick. Taste it. If it needs a little salt to bring the flavours out, add some a little at a time and keep tasting as you do so. That’s it! Done! You could do lots with this basic recipe. Add more chili, throw in some jalapenos, use different cheese, mix in some chopped Chorizo with the onion, add roasted garlic or stir in fresh coriander at the end of cooking. Just make sure you have plenty of stuff to dip in because this is delicious! Our best intentions are challenged daily and we often find ourselves making choices we thought we wouldn’t. This applies to food too. When I’m tired, grumpy, or both, what sort of food do I crave? What sort of meals do I end up preparing? Certainly not the kind that will benefit my family or my heart. That’s why planning meals is useful. Shopping for specific ingredients rather than random items that may or may not make a meal or two is definitely wisest. Even so, there are times when unplanned meals come together with the ingredients in the fridge. That’s what happened today and the results were tasty, filling and chalked up some brownie points with my wife. She loves it when we, “use things up”, although, if we shopped smarter, we wouldn’t need to do so! 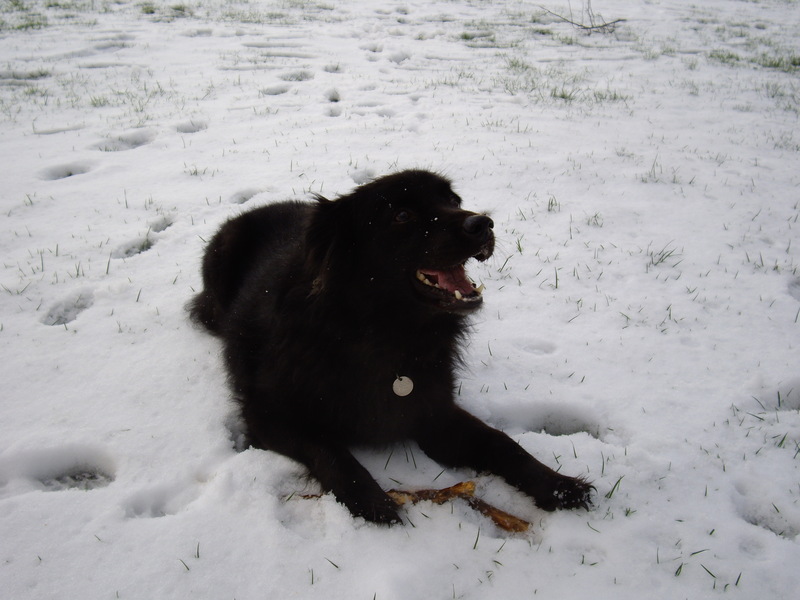 The temptation to resort to frozen pizzas or take away is not always easy to resist when you’re exhausted. That’s one of the battles being fought by food lovers the world over, particularly the Slow Food movement. Today, quality food prevailed. I wanted to sit down and eat some cake, but you’ll be glad to hear that I chose instead to fight the good fight. I decided to make an omelette with lots of my favourite things in it. This is a fantastic opportunity to use up various bits and bobs. It was also a good way of getting a variety of healthy ingredients into my body without resorting to making a salad. Nice as they can be, I’m just not a salad fan, and listening to the rain hit the windows didn’t inspire any urges for a leafy dinner. The variations on this recipe are too numerous to list, but I definitely would have use more herbs from the garden (thyme, Greek oregano, parsley, mint, marjoram) if the rain hadn’t been bouncing off the ground. Use what’s in and try to keep it colourful. Use a high heat to stop the courgette becoming soggy. 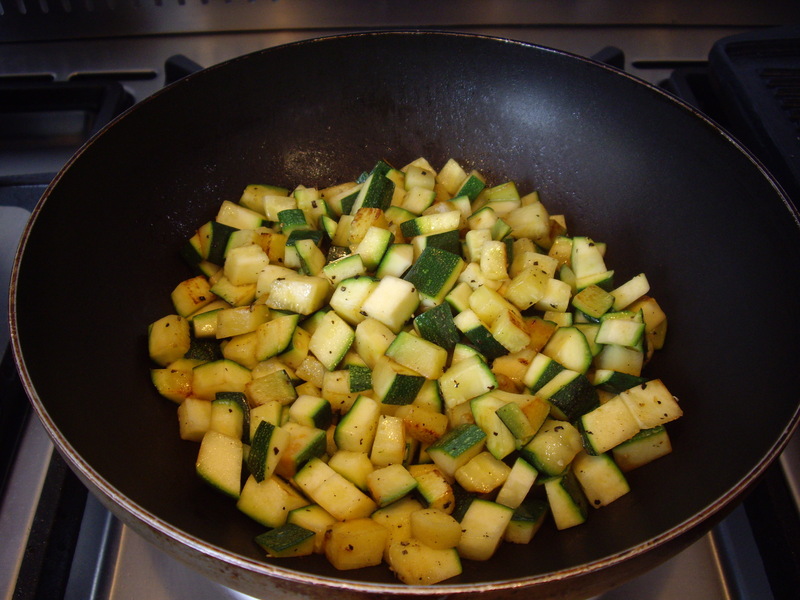 Heat some oil in a frying pan or wok and fry the courgette on a high heat. 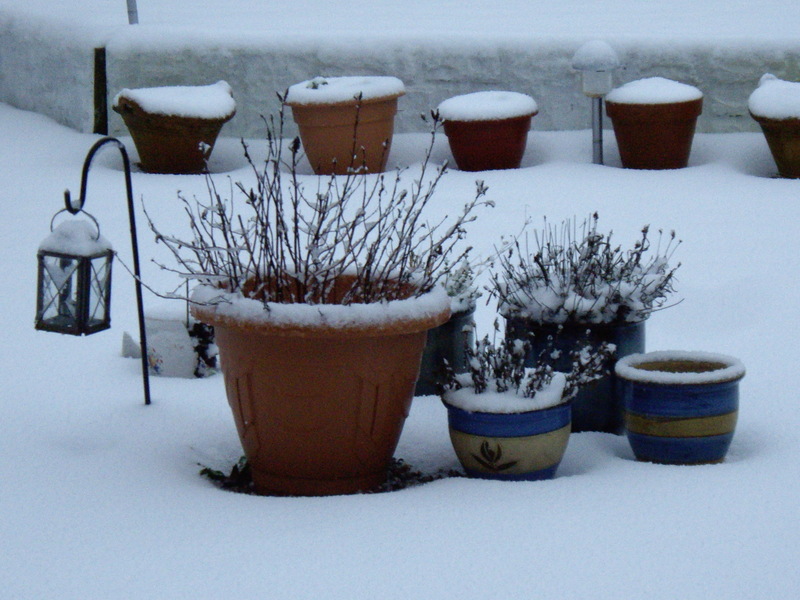 Courgettes have a high water content and low temperatures will simply allow the courgette to release that water and go soggy. Once it begins to brown, take it off the heat and set it aside in a bowl. Next gently fry the onion and garlic until soft and just cooked. Don’t brown them. Set these aside too. Beat the eggs and season with salt, pepper and oregano. Heat a large frying pan and add a little oil before pouring the eggs in. Quickly add the courgette, tomatoes, basil, onion and garlic and Kalamata olives. Do they need to be from Kalamata? Nope. A huge variety of olives are available. Spanish olives are the most common, though these tend to be poor quality unless you’re willing to spend more. Be careful. Some companies are well aware of the desirability of Greek olives and package their Spanish produce cleverly, going as far as displaying a small Greek flag on their jars. The easiest way to spot dodgy olives is by looking out for phrases like Greek-style olives. Like all things, paying a little more will give you a completely different product that is worth your time. 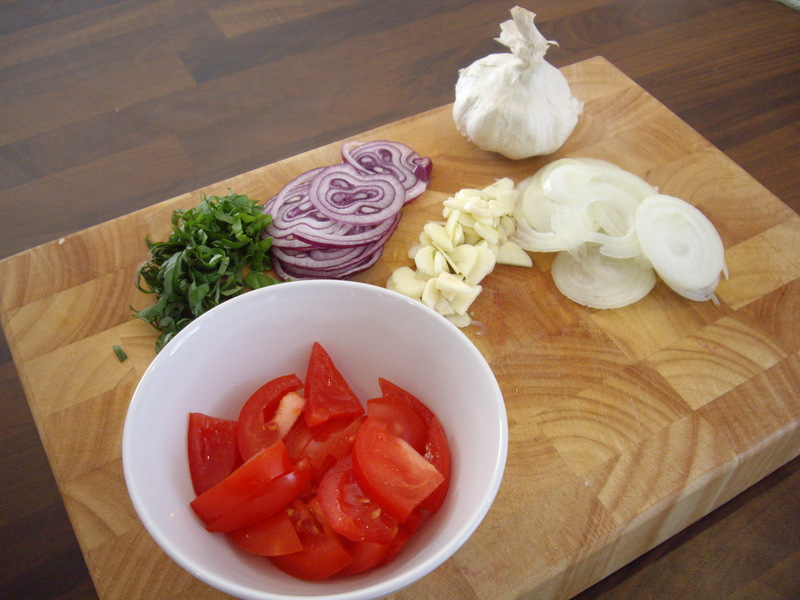 Simple dishes rely on the quality of the ingredients. Perhaps I’m a little too passionate about olives. Let’s get back to the omelette. The simpler the dish, the better the ingredients need to be. Cook the omelette on a low heat so that it can cook through without needing to be turned over. 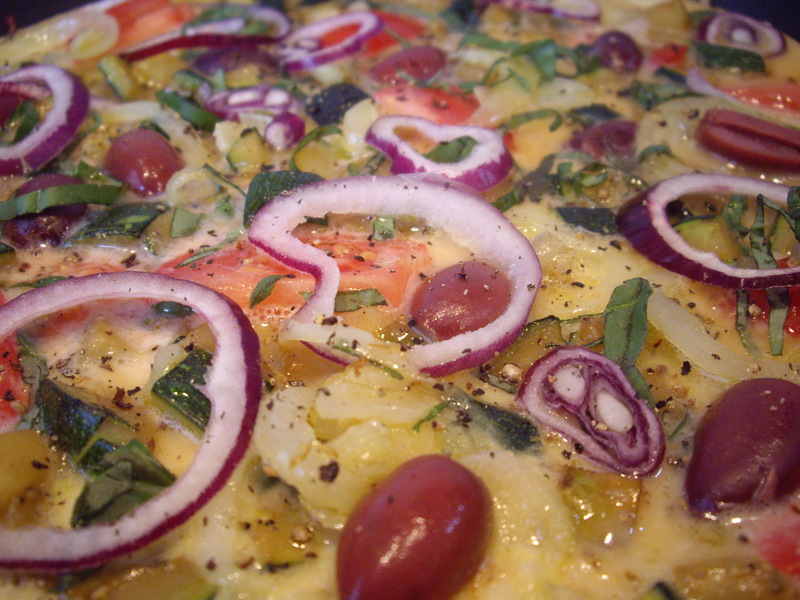 I’ve included red onion in the recipe for colour and because I like the fresh, sweet taste. It doesn’t really need to be cooked. The white onion and garlic would be overpowering if left uncooked, hence the quick fry. Add the red onion last and grind some pepper over the omelette as it is cooking. Once the egg has cooked through and is no longer runny on top, slide it onto a plate and season again if necessary. I think this is a great summer meal that could be shared and eaten with salad (if you want to live your life like that). A little drizzle of extra virgin olive oil helps it go down a treat! Eating colourful food makes you feel good!